Plus Minted is THE BEST TIME SAVER. My favorite thing about Minted is that they do pre-printed address labeling - for free! It saves so much time, writing. I loaded up my mailing addresses easily and now I never worry where an address is! Plus as you can see from my envelopes the addressing is really ornate. I chose Christmas theme for my holiday cards to make them look more festive. Minted can also do return address labeling pre-printed on all your cards so no need to add labels for return addresses. They even have holiday stamps that can match your theme so you can avoid a trip to the post office! And this year I just noticed that they allow me to pic from my address list the same list I have used for previous cards. What does that mean? The list of addresses I used last year was pulled up with a click - I did not have to go back through every address and click on the ones I wanted - all I did was add a few new names from this past year and I was done! The turn around time varies but it can be really fast if you waive proofing/review of the images. Even if you proof it they usually turn it around in less than 24 hours which I think is pretty impressive. I got my proof this year in less than 24 hours and my cards in 4 days from the date I ordered them. ​So maybe you did not send out your holiday cards yet or maybe you like to send your well wishes in the New Year. 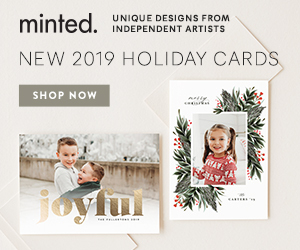 If so, you still have time to order your holiday cards plus 20% off your holiday card order now!